Well, what do you guys think? Holy CoW! That was fun for me to watch, but I like funny bikes. I think Fabian can now indeed say that it is NOT about the bike. Cancellara looked amazing. Kudos to Lance, Levi, George, and Zibriskie, though...all good finishes. George was PISSED when he saw his time! I think Floyd's hip needs to be oiled. Floyd needs to replace the replacment...maybe a carbon fiber model? Fabian is the man. Levi looks hella strong as always. Don't forget Tough Tuft. Go Canada Go!!. I loved it. My wife thought is was boring. I have mixed opinions of your wife right now (who I obviously don't know). Hotness gives her positive points, but calling that race boring? Negative points. Of course, watching the race at all? Positive points. Ok, your wife still rocks. Yeah. She watched some of it. But I got all excited and she just couldn't hold the same enthusiasm. As nice as it is to see live racing on tv again... Prologue TT's = Not exciting. Sorry. Levi trembling with (rage? adrenaline? what?) in the start house. Wow. It looked like he was going to punch someone. I think there's motivation and there's *motivation*. That the latter type. The last 10 or so riders were great. A lot of action. I was rooting for big George the whole time and he was PISSED when he saw he got second. Almost fell off the bike. Anyone notice when they showed the finish of Michael Rogers you see someone try to cross the street in the background and fall right on their face. I had to replay it a couple of times lol. Either way Cancellara rode great. I kind of feel bad Levi got second but I am sure it will motivate him even more. So instead of shaking violently in the start house he may just pass out. I know the guy who did the holding of the riders this year. He held the riders last year too and said Levi was all herky jerky then and about nailed him in the face with the back of his aero helmet. You could put an eye out with one of those things. It's a blessing in disguise that Levi got second. Astana won't have to work the entire race to keep him in yellow. That now falls on Saxo... And we all know that Fabian will not hold it till the end. yep the weather degenerated through the race and it was freezing and windy when levi rolled out. tomorrow should be pretty gnarly. i didn't even know who won until i got back to my room and read this thread. here's a quick and dirty of cancellara from my 10" netbook. i'll have some better stuff up later. Last edited by erader; 02-14-09 at 07:19 PM. I always liked Zabriskie and Vandervelde so I am happy for their good performances. I am a Lance fan too and his performance is a window into how strong he really is as to not race for a few years and place that high in such a competitive field is pretty incredible. Makes me wonder if he held a little back to make sure he didn't upstage Levi. I don't think Lance held anything back. He's more than type that excels on a long pain-train, not a short burst like this prologue. funn-nay! ^^ it was an awesome race to hear/watch on the shotty amgen tour tracker at work. vs is airing highlights at 8 pm and 11pm pst (check your listings)...but their site uploads the good stuff later in the day as well. LOL. 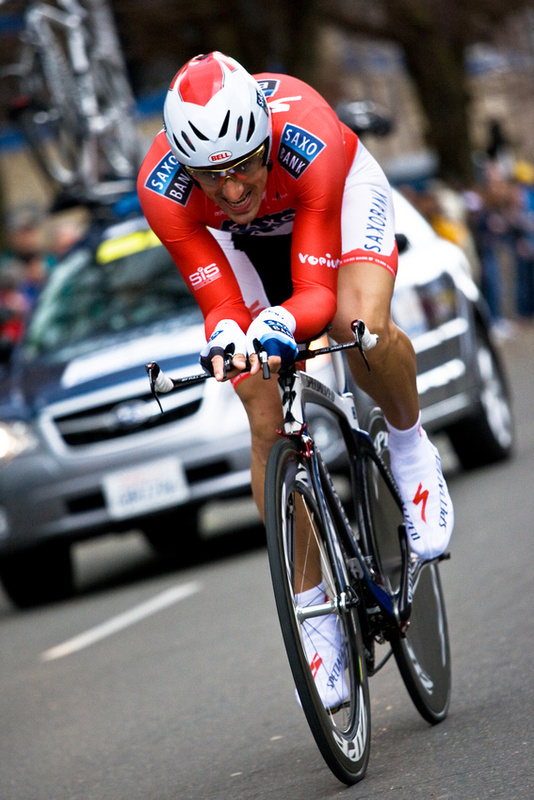 If Cancellera was on a Leader bike he would still win the Prologue. But anyway, I always knew the Transition was better than the P3 or P4. That shaking thing Levi does isn't from the cold, it's some sort of Bruce Lee shi* he does to get psyched up. He was really freaking before the Solvang TT last year.